We recently had the chance to review a cute little Easter decoration from Lenox. About the Lenox Corporation: "Lenox Corporation is a market leader in quality tabletop, giftware and collectibles. The company markets its products under the Lenox, Dansk and Gorham brands. A shared commitment to quality and design puts our brands among the best known and respected in the industry. Collectively, we span 340 years of tabletop and giftware expertise." "Tuck an Easter surprise in this charming egg box. Crafted of fine porcelain and beautifully decorated by hand. 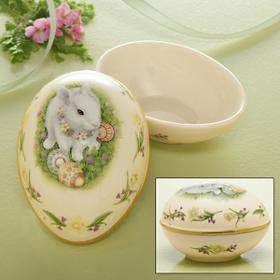 Crafted of hand-painted fine porcelain Accented with 24 karat gold Height: 2 1/4" Introduced 2011 Imported Suggested Retail: $29.00 Our Price: $19.95"
What we thought: This is a really cute decorative piece just in time for Easter! As always, Lenox has created a gorgeous piece of fine art at an affordable price. This would be perfect for an Easter centerpiece or gift. ABCD Diaries gives Lenox an A+! Disclosure: ABCD Diaries was given a decorative egg for review purposes only. We were in no other way compensated. The opinions expressed in this post are ours and ours alone.